Juliette and Jack from team Tarrytown describe their team’s first day in Haiti. We woke up, bright and early, around 6 o’clock, to get a fresh start to a brand new and anticipated day. Instead of the usual alarm clocks, buzzing with an iPhone ringtone, we awoke to the “baaahs” of a baby goat, and the crows of the Rooster, both that live on the compound. After a delicious breakfast, filled with sleepy morning chatter, the ten of us quickly dressed ourselves for a hard day of work, and packed into the back of a pick-up truck like sardines(!). Picture this: the worst pothole on a road nearby you. Now add 10x more holes, bumps, crevices, rocks, etc to that road, now take away the pavement- there you have it, the main Highway of Pignon! We spent about twenty minutes of driving, filled with waves and pleasant “Bonjous” (Good Morning) and exchanges with locals, until arriving at our first destination of the day. The house was surrounded by jovial children and infants, all happy to see and meet us! The crew was already hard at work, mixing cement and creating the floor, which would be a foundation for the health and well-being of the family. We assimilated right into the work and were able to complete two houses in just one morning, with the help of our Haitian counterparts. Many Hands make light work while putting in cement floors! After work we enjoyed a wonderful lunch prepared by two amazing chefs, and got to know the Many Hands staff. Then we hopped back into the truck for a brief excursion to the town of Pignon to get some dinner supplies and explore our surroundings a bit more. This turned out to be a very impactful visit, despite its’ brevity. 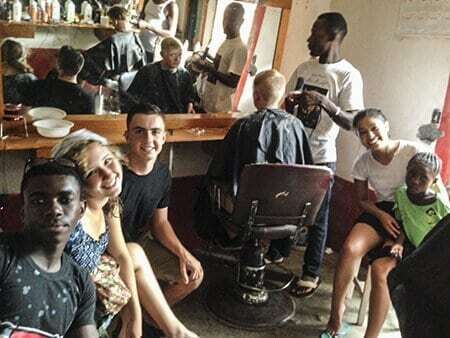 Within an hour, we had witnessed a funeral procession, embraced some local children, and managed to get haircuts at a local barbershop. The rain was no hindrance to us having fun back at the campus, playing soccer, Frisbee, bowling and cards. Our bonds were strengthened with the staff after these wonderful activities, and even more so with each other after a thorough discussion of our day and what great things await!!! So proud of our young people! Thanks for posting.